According to several newly published reports by the U.S. Geological Survey, coal-tar-based sealants are emitting polycyclic aromatic hydrocarbons (PAHs) into the air at rates possibly greater than annual emissions from automobiles in the US. Four new reports examine the contaminants polycyclic aromatic hydrocarbons (PAHs) found in house dust, streams, lakes, soil, and air. Children living near coal-tar-sealed pavement are exposed to twice as many PAHs from ingestion of contaminated house dust than from food, according to a separate new study by Baylor University and the USGS, published in the journal Environmental Pollution. Several PAHs are probable human carcinogens and many are toxic to fish and other aquatic life. These results and those of previous research on environmental contamination and coal-tar-based pavement sealants are summarized in a feature article appearing today in the journal Environmental Science and Technology. The article is jointly authored by researchers with the USGS, Minnesota Pollution Control Agency, University of New Hampshire, City of Austin Texas, and Baylor University. Links to the four new articles on this topic can be found on the USGS website on PAHs and sealcoat. 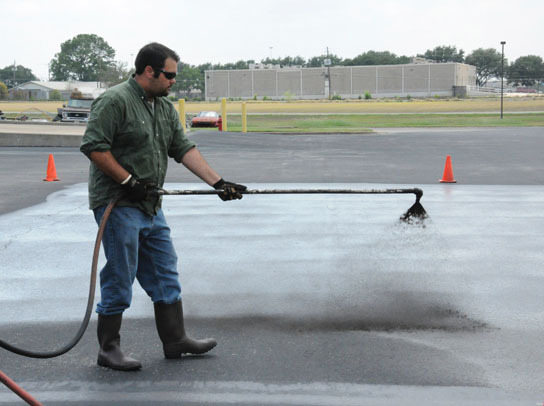 Coal-tar-based sealant is the black liquid sprayed or painted on many parking lots, driveways, and playgrounds. An estimated 85 million gallons are used each year, primarily in the central and eastern U.S. Coal tar is known to cause cancer in humans and is made up of more than 50 percent PAHs. “The value of this research is that it identifies the pathways by which PAHs move from pavements to people and measures the contribution in relation to other sources,” said USGS Director Marcia McNutt. “The most striking finding is that pavement sealcoat contaminates virtually every part of our every-day surroundings, including our air and our homes. Scientists estimate that the amount of PAHs released to air nationwide each year from new applications of coal-tar-based sealant are similar to or greater than annual PAH emissions from vehicles. 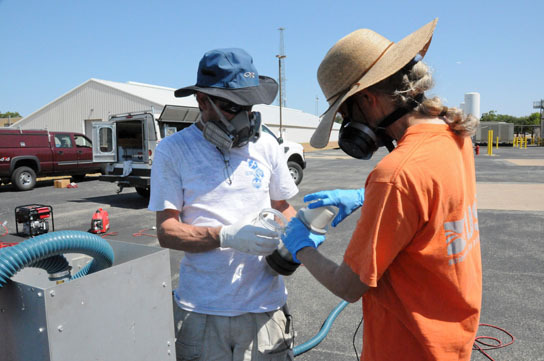 USGS scientists measured PAHs in air above parking lots, with and without sealcoat, in suburban Austin, Texas. In a second study, PAH levels in air and in dried sealant were tracked for one year following sealant application to a parking lot. Two hours after sealcoat application, PAH emissions were 30,000 times higher than those from unsealed pavement. Parking lots with three to eight-year-old sealant released 60 times more PAHs to the air than parking lots without sealant. Coal-tar-based sealcoat causes contamination indoors as well as outdoors. Baylor University scientist Spencer Williams used USGS measurements of PAHs in house dust to estimate the potential ingestion of PAHs by young children living near coal-tar-sealed parking lots. Ingestion of PAHs from food has long been thought to be the primary route by which children are exposed to PAHs. Williams’ analysis indicated that children living in apartments adjacent to parking lots with coal-tar-based sealcoat likely receive more than twice as much PAHs from incidental ingestion of house dust than from their diet. PAH ingestion by children in those settings was estimated to be 14 times higher than by children in apartments adjacent to unsealed parking lots. Some governments have taken action on use of coal-tar-based sealcoat. Fifteen municipalities and two counties in four states (Minnesota, New York, Texas, and Wisconsin), the District of Columbia, and the state of Washington all have enacted some type of ban, affecting almost 10.4 million people. Several national and regional hardware and home-improvement retailers have voluntarily ceased selling coal-tar-based driveway-sealer products. Two kinds of sealcoat products are widely used: coal-tar-based and asphalt-based. The coal-tar products have PAH levels about 1,000 times higher than the asphalt products. Asphalt-based sealcoat is more commonly used on the West Coast and coal-tar-based sealcoat is more commonly used in the Midwest, the South, and the East. Consumers can determine whether a product contains coal tar by reading the product label or the associated Materials Safety Data Sheet (MSDS), available from the applicator, retailer, or on the Internet. Be the first to comment on "Coal-Tar-Based Sealants Emitting PAHs at Rates Possibly Greater than Auto Emissions"